Me: *sad voice* Yes, I ate it. Him: Why'd you eat it? Him: Why'd you eat it then? Why didn't you just taste it? Me: I didn't mean to eat it! Him: How could you 'not' mean to eat it? Me: Because I was tasting it, and it just sorta happened. Me: Well, it's sorta like when you see a huge, delicious chocolate cake....and you just want to taste it. So you dip your finger in the icing and you taste it. Well, you can't stop there, can you? It's just too good! So you dip your finger in again, and again, and before you know it, the whole freakin' cake is gone. .....Well, I couldn't just dip my finger in the kitty because...well...that's kinda gross. *pause to stop the giggles that are approaching* So I, uh, just tasted it once, and when I went back for more, I just ate the whole damn thing. See? 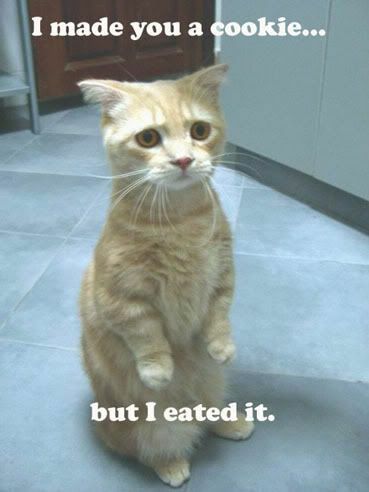 I didn't 'mean' to eat the kitty....it just sorta happened. And 'that', my dears, is what happens when it's 4 in the morning and a guy asks how the kitty is that you'd been talking about previously. If it weren't so incredibly random, you might find sexual connotations in there somewhere......but really, it was just pure, random 'real' kitty talk. To make matters worse, when I spoke about eating it earlier (yes, I had actually already eaten the thing several hours later....so it's 'his' fault for bringing it back up), I spoke of the hairballs. I think 'dipping' in the kitty was so much worse, though. Man, I love that picture. I've seen it before and I always wonder if it's photoshopped or not.